Chicago Stadium was an indoor arena located in Chicago, Illinois that opened in 1929 and closed in 1994. It was the home of the National Hockey League's Chicago Blackhawks and the National Basketball Association's Chicago Bulls. The Stadium hosted the Chicago Blackhawks of the NHL from 1929 to 1994 and the Chicago Bulls of the NBA from 1967 to 1994. The arena was the site of the first NFL playoff game in 1932; the 1932, 1940, and 1944 Democratic National Conventions; and the 1932 and 1944 Republican National Conventions, as well as numerous concerts, rodeo competitions, boxing matches, political rallies, and plays. In addition to the close-quartered, triple-tiered, boxy layout of the building, much of the loud, ringing noise of the fans could be attributed to the fabled 3,663-pipe Barton organ, boasting the world's largest theater organ console with 6 manuals (keyboards) and over 800 stops, and played by Al Melgard. Melgard played for decades during hockey games there, earning the Stadium the moniker "The Madhouse on Madison". For years, it was also known as "The Loudest Arena in the NBA", due to its barn-shaped features. When the Stadium closed in 1994 the organ was removed and prepared to be installed in the 19th hole museum. Soon after the museum closed, sending the organ along with another theatre organ to a warehouse in Phoenix Arizona. In October 1996, a propane tank explosion melted and destroyed both pipe organs, excluding the console. The organ is currently in the residence of Phil Maloof and is in good working condition with new pipes. In the 1973 Stanley Cup Final against Montreal, Chicago owner Bill Wirtz had the NHL's first goal horn installed in the building, reportedly because he liked the sound of the horn on his yacht. This practice would, in the ensuing years, become almost commonplace in professional hockey. Nancy Faust, organist for 40 years at Chicago White Sox games, also played indoors at the Stadium, at courtside for Chicago Bulls home games from 1976–84, and on the pipe organ for Chicago Blackhawks hockey there from 1985-89. It also became traditional for Blackhawk fans to cheer loudly throughout the singing of the national anthems, especially when sung by Chicago favorite Wayne Messmer. Denizens of the second balcony often added sparklers and flags to the occasion. Arguably, the most memorable of these was the singing before the 1991 NHL All-Star Game, which took place during the Gulf War. This tradition has continued at the United Center. Longtime PA announcer Harvey Wittenberg had a unique monotone style: "Blackhawk goal scored by #9, Bobby Hull, unassisted, at 6:13." The Chicago Stadium also provided a unique fan experience. On the west side of the building was the Players/Employee/VIP Visitors Parking Lot. It is also where Teams/Bands/Politicians/Performers would enter the building through the legendary Gate 3 1/2 (Appropriately placed between Gates 3 and 4 on the North and South Sides). Although protected by fencing, it was where fans could see the talent get out of their cars or teams exit their buses before going into the building. It was also a great autograph and informal "meet and greet" opportunity. In 1992, both the Blackhawks and the Bulls reached the finals in their respective leagues. The Blackhawks were swept in their finals by the Pittsburgh Penguins, losing at Chicago Stadium, while the Bulls won the second of their first of three straight NBA titles on their home floor against the Portland Trail Blazers. The next time the Bulls clinched the championship at home, was in the newly built United Center in 1996 (when they did so against the Seattle SuperSonics), their second season at the new arena, and the Blackhawks would not reach the Stanley Cup Finals again until 2010 (in which they defeated the Philadelphia Flyers in six games), their 16th season in the new building, although they won their first championship since 1961 in Philadelphia. The Blackhawks last won the Stanley Cup at the Stadium in 1938; they did not win the Cup again at home until 2015 at the United Center. It was also the last NHL arena to retain the use of an analog dial-type large four-sided clock for timekeeping in professional hockey games. Boston Garden and the Detroit Olympia (as well as the Buffalo Memorial Auditorium in its pre-NHL days) had identical scoreboards but replaced them with digital timers in the mid-1960s, with Boston having their digital four-sided clock in use for the 1969–70 NHL season. 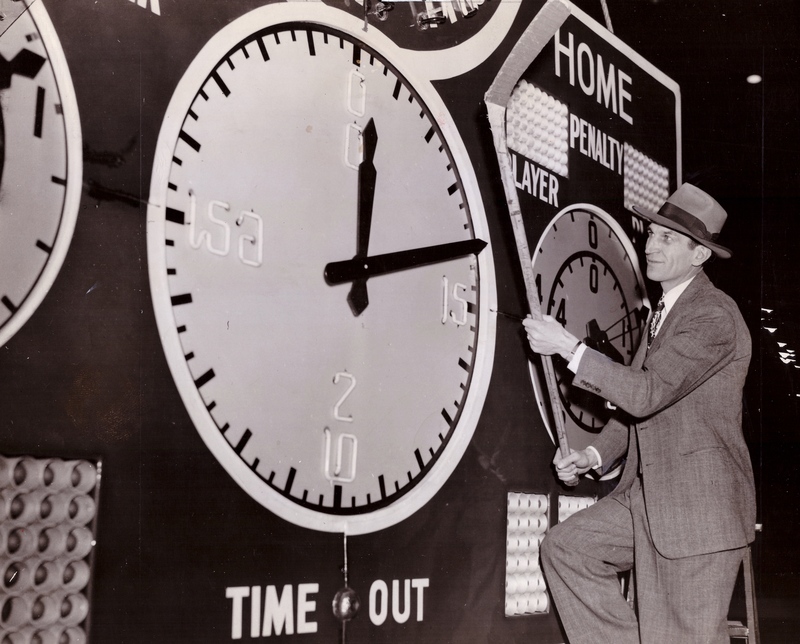 After removing the balcony-edge game clocks at either end and at mid-ice zones of the Stadium, the replacement four-sided game clock suspended over center ice of the Stadium, built by Bulova as their "Sports Timer", was installed in Chicago in 1943. Each side of the clock had a large diameter 20-minute face in the center that kept the main game time for one period of ice hockey, with a set of shorter black-colored minute and longer red-colored sweep-second hands, and a pair of smaller, 5-minute capacity dual-concentric faces for penalty timekeeping, to the left and right of the primary 20-minute face — with each of the 5-minute penalty timers having its own single hand and each clock face, both the central main timer's dial and flanking penalty timer dials (when a penalty was counting down) illuminated from behind during gameplay. The "outer" face of each penalty timer had a single hand that avoided obscuration of the "inner" face and its own, "solid" single hand, through the use of metal rods forming the outer hand's "shaft", holding its hand's "pointer" head — the set of two concentric faces for each penalty timer dial could handle two penalties for each set, with an illuminated "2" on each penalty timer dial lighting up to display a minor penalty infraction. It was difficult to read how much time was left in a period of play on the main game timer's large face, as each minute of play was marked by a longer line on every third "seconds" increment on the central main dial, due to the minute hand's twenty-minute "full rotation" timing capacity for one period of ice hockey. The difficulty was compounded on the main central dial from the aforementioned minute and sweep-second hands being in constant motion during gameplay. The "Sports Timer's" only digital displays were for scoring and for penalized players' numbers, each digit comprising a six-high, four-wide incandescent light dot matrix display. That clock eventually was replaced by a four-sided scoreboard with a digital clock, first used on September 21, 1975 in Blackhawks preseason play, crafted by the Day Sign Company of Toronto, much like the one used at the end of the 1960s (and constructed by Day Sign Company) to replace the nearly identical Bulova Sports Timer game-timekeeping device in the Boston Garden, and then in 1985 by another, this one with a color electronic message board. That latter scoreboard was built by White Way Sign, which would build scoreboards for the United Center. A plaque with the words "Chicago Stadium – 1929–1994 – Remember The Roar" is located behind a statue of the Blackhawks greatest players on the north side of the United Center. 1994: The final event at Chicago Stadium was Scottie Pippen's Ameritech Classic charity basketball game, which was organized through Reverend Jesse Jackson's Push-Excel program and was held on September 9, 1994. Michael Jordan, despite being in retirement at the time (he would return to basketball seven months later), participated and scored 52 points, leading the White team to a 187–150 victory over Pippen's Red team. At the end of the game, Jordan kneeled and kissed the Bulls logo at center court. 1934: The Blackhawks win the Stanley Cup on home ice by defeating the Detroit Red Wings 1-0 in the second overtime in game four of the Stanley Cup Finals. 1938: The Blackhawks win the Stanley Cup on home ice by defeating the Toronto Maple Leafs 4-1 in game four of the Stanley Cup Finals. This was the Blackhawks' last Stanley Cup win in Chicago Stadium. 1961: Bobby Hull scored twice in Game 1 of the Stanley Cup finals, won 3-2 by the Chicago Black Hawks over the Detroit Red Wings. The Blackhawks would go on to win the Stanley Cup at Detroit's Olympia Stadium, winning the series 4-2. Later, the team made it to the finals five more times (1962, 1965, 1971, 1973, and 1992), but they lost in all those series. 1992: The last Stanley Cup Finals game at Chicago Stadium was played on June 1. The Pittsburgh Penguins swept the series 4–0 and won game 4 6–5, capturing their second consecutive Stanley Cup. 1975: The Rolling Stones' Tour of the Americas '75 stopped here July 22–24. 1975–76: December 31-January 1: Frank Sinatra met the new year in Chicago Stadium, performing a concert with 23 songs. 1979: The Bee Gees performed two sold-out shows here on July 30–31, 1979. 1981: Michael Jackson and his brothers brought their Triumph Tour to the Stadium on August 28. 1936: Presidential election rallies for both Republican Alfred Landon and Democrat Franklin D. Roosevelt. Roosevelt's rally drew a crowd of over 1,000,000, with more than 200,000 attendees overwhelming the stadium's capacity of 25,000. ^ "Work on Chicago's New Sports Arena". Milwaukee Journal. July 3, 1928. Retrieved March 28, 2012. ^ Kamin, Blair (September 19, 1993). "Is Comiskey Upper Deck A Problem?". Chicago Tribune. Retrieved March 28, 2012. ^ Grossman, Evan (April 25, 2016). "The history behind the NHL's ubiquitous sound for scoring: the goal horn". New York Daily News. Retrieved January 27, 2017. ^ "Rhode Island Reds Heritage Society — The Arena Clock". www.rireds.org. Rhode Island Reds Heritage Society. Retrieved April 1, 2014. ^ Soderstrom, Carl; Soderstrom, Robert; Stevens, Chris; Burt, Andrew (2018). Forty Gavels: The Life of Reuben Soderstrom and the Illinois AFL-CIO. 2. Peoria, IL: CWS Publishing. pp. 104, 107-108. ISBN 978-0998257532. The 1932 NFL Playoff Game was an extra game held to break a tie in the 1932 season's final standings in the National Football League. It matched the host Chicago Bears and the Portsmouth Spartans. Because of snowfall and anticipated extremely cold temperatures in Chicago, Illinois, it was moved indoors and played at the three-year-old Chicago Stadium on December 18 on a reduced-size field on Sunday night. The 1932 Republican National Convention was held at Chicago Stadium in Chicago, Illinois, from June 14 to June 16, 1932. It renominated President Herbert Hoover and Vice President Charles Curtis for their respective positions.Hoover was unopposed for the nomination, despite a lackluster Republican Party. Nonetheless, the convention praised Hoover and pledged itself to maintain a balanced budget. The 1944 Democratic National Convention was held at the Chicago Stadium in Chicago, Illinois from July 19 to July 21, 1944. The convention resulted in the nomination of President Franklin D. Roosevelt for an unprecedented fourth term. Senator Harry S. Truman of Missouri was nominated for Vice President. Including Roosevelt's nomination for the vice-presidency in 1920, it was the fifth time Roosevelt had been nominated on a national ticket. The keynote address was given by Governor Robert S. Kerr of Oklahoma, in which he "gave tribute to Roosevelt's war leadership and new deal policies." The 1987–88 Chicago Bulls season was the 22nd season of the franchise in the National Basketball Association (NBA). The Bulls finished second in the Central Division with a solid 50–32 record. Michael Jordan was named Most Valuable Player of The Year and Defensive Player of The Year. He also won the All-Star Game MVP and Slam Dunk Contest during the All-Star Weekend, which was held in Chicago. In the first round of the playoffs, the Bulls defeated the Cleveland Cavaliers in five games, but lost to the Detroit Pistons in five games in the semifinals. Following the season, Charles Oakley was traded to the New York Knicks. The 1989 NBA playoffs was the postseason tournament of the National Basketball Association's 1988–89 season. The tournament concluded with the Eastern Conference champion Detroit Pistons defeating the Western Conference champion Los Angeles Lakers 4 games to 0 in the NBA Finals. Joe Dumars was named NBA Finals MVP. The Pistons had one of the most dominant playoff runs in NBA history, finishing 15–2 with their only losses to the Chicago Bulls in the Eastern Conference Finals. The Lakers won the Western Conference title without losing a game, and entered the NBA Finals as the heavy favorites. However, they were swept in the Finals by the Pistons, due in part to season-ending injuries suffered by Magic Johnson and Byron Scott. The Lakers became the first team in NBA history to open an NBA post-season with 11 straight victories and to sweep three series in an NBA post-season. Chicago advanced to the Eastern Conference Finals for the first time since 1975 (and the first time in Michael Jordan's career), but their season was ended by Detroit for the second straight year. Two rounds earlier, he hit "The Shot" over Craig Ehlo at the buzzer to beat the Cavs. The Boston Celtics' first-round playoff sweep by the Pistons was the first time they failed to get past the round of 16. Boston's chances were hampered by the absence of Larry Bird during these playoffs due to a season-ending injury earlier in the season; the first and only time in Bird's NBA career he'd miss playing in the playoffs. Former Utah Jazz head coach Jerry Sloan made the first of 19 playoff appearances in a 22-year tenure. The only time he missed the playoffs with Utah was 2004–2006. Prior to this, he had last appeared in the playoffs in 1981 with the Bulls. His Jazz were ousted by the Golden State Warriors 3–0, the second time a seventh seed had beaten the second seed in the playoffs. Under Don Nelson, the Warriors became famous for their up-tempo game that made up for an undersized lineup, as well as their ability to create mismatches. The Warriors made history as the only team to beat either of the top two seeds thrice in the NBA Playoffs; they beat the second-seed San Antonio Spurs in 1991 and top-seeded Dallas Mavericks (a team Nelson also coached) in 2007. The 1990 NBA playoffs was the postseason tournament of the National Basketball Association's 1989–90 season. The tournament concluded with the Eastern Conference champion Detroit Pistons defeating the Western Conference champion Portland Trail Blazers 4 games to 1 in the NBA Finals. Isiah Thomas was named NBA Finals MVP. It was the Blazers' first trip to the NBA Finals since their stunning victory in the 1977 NBA Finals. The New York Knicks fell behind 2–0 to the Boston Celtics in their first round matchup, but took the series 3–2 by winning Game 5 124–117 in Boston Garden. The Phoenix Suns defeated the Los Angeles Lakers in a playoff series for the first time ever. It also marked the first time since 1981 that the Lakers failed to reach the Western Conference Finals, ending the longest such run since the Bill Russell-led Boston Celtics, who made the Eastern Conference Finals thirteen consecutive times between 1957 and 1969. It was the first NBA Finals to not feature the Lakers or Celtics since 1979. The Chicago Bulls lost Game 7 of the Eastern Conference Finals 93–74 in Detroit, making it the third straight year they were ousted in the playoffs by the Pistons. The Indiana Pacers made only their third playoff appearance since their NBA debut in the 1976–77 season; they proceeded to make the playoffs 16 out of the next 17 years (missing only in 1997). The Dallas Mavericks made their only playoff appearance of the decade. They did not return until 2001. Game 5 of the NBA Finals was the last NBA game to be televised on CBS. The 1990–91 NBA season was the Bulls' 25th season in the National Basketball Association. During the offseason, the Bulls acquired Dennis Hopson from the New Jersey Nets. The Bulls stumbled out of the gate losing their first three games, but it would only be a minor hurdle. The Bulls finished in first place in the Central Division, as well as first overall in the Eastern Conference with a 61–21 record, surpassing their previous franchise-best from the 1971–72 season. Michael Jordan won another scoring title and his second MVP award, while being selected for the 1991 NBA All-Star Game. In the first round of the playoffs, the Bulls swept the New York Knicks in three straight games. Then in the semifinals, they defeated the 5th-seeded Philadelphia 76ers in five games. In the Eastern Conference Finals, they swept the defending champion Detroit Pistons in four straight games, and advanced to the NBA Finals for the first time. The Bulls would go on to beat the Los Angeles Lakers in the 1991 NBA Finals in five games, winning their first ever championship in franchise history. This season was the first of three consecutive NBA titles for the Bulls, as well as marking the beginning of the legendary Bulls Dynasty, which would net the team another five more championships throughout the 1990s. The 1991 NBA playoffs was the postseason tournament of the National Basketball Association's 1990–91 season. The tournament concluded with the Eastern Conference champion Chicago Bulls defeating the Western Conference champion Los Angeles Lakers 4 games to 1 in the NBA Finals. Michael Jordan was named NBA Finals MVP. After the Pistons had ended their season the last three years, the Bulls got revenge in the Eastern Conference Finals by sweeping the two-time defending NBA champions. It was the first time the Bulls won a playoff series over the Pistons since 1974, when both teams were still part of the Western Conference. Game 4 ended with some of the Pistons walking off the court before time expired, refusing to shake the Bulls' hands. In the 1989 NBA Finals, the Pistons themselves had swept the two-time defending champion Lakers. Detroit did not reach the conference finals again until 2003. The seventh seeded Golden State Warriors stunned the San Antonio Spurs in the first round of the playoffs, defeating them 3 games to 1. It would be Golden State's last playoff series win until 2007. The 76ers and the Bucks met in the first round of the playoffs where the 76ers swept the series. It would be both teams last playoff appearance until 1999. Game 4 of the Blazers–Jazz series was the last game ever played at the Salt Palace. The Spectrum hosted its final NBA playoff game in Game 4 of the Bulls–76ers series. When the 76ers returned to the playoffs in 1999, they had moved to the CoreStates Center, their home since the 1996–97 season. This was the first year that NBC aired the NBA Playoffs. The 1991–92 NBA season was the Bulls' 26th season in the National Basketball Association. The Bulls entered the season as defending NBA champions, having defeated the Los Angeles Lakers in the 1991 NBA Finals in five games, and winning their first NBA championship in franchise history. This Bulls team is regarded as one of the most talented and successful in the 90s Bulls dynasty. Early into the season, the Bulls traded Dennis Hopson to the Sacramento Kings after the first two games. Coming off their first ever championship, the Bulls had a very successful season winning 14 consecutive games after a 1–2 start to the season. They later on posted a 13-game winning streak in January, which led them to a 37–5 start. The Bulls finished in first place in the Central Division, along with having the best record in the league at 67–15. Michael Jordan captured his second straight MVP, and sixth straight scoring title. He was also selected for the 1992 NBA All-Star Game along with Scottie Pippen. In the first round of the playoffs, the Bulls swept the Miami Heat in three straight games. In the semifinals, they defeated the New York Knicks in a full seven game series. As they advanced to the Eastern Conference Finals, they would defeat the Cleveland Cavaliers in six games, making their second trip to the Finals. In the 1992 NBA Finals, they would go on to beat the Portland Trail Blazers four games to two to win their second consecutive championship, and second of three straight. The 1992 NBA playoffs was the postseason tournament following the National Basketball Association's 1991-92 season. The tournament concluded with the Eastern Conference champion Chicago Bulls defeating the Western Conference champion Portland Trail Blazers 4 games to 2 in the NBA Finals. Michael Jordan was named NBA Finals MVP for the second straight year. The Blazers won their second Western Conference title in the past three years, third overall in franchise history, behind the leadership of Clyde Drexler. The Jazz made the Western Conference Finals for the first time in franchise history. They returned in 1994 and 1996 before finally breaking through in 1997. The fourth-year Miami Heat became the first of the 1988 and 1989 expansion teams to make the playoffs, though they were swept in the first round by the Bulls. In 2006, the Heat would become the first of these teams to win the NBA title. This was the first year since 1987 that the Bulls and Pistons did not meet in the playoffs. They did not meet again until 2007. The Clippers made it to the playoffs for the first time since 1976, when they were the Buffalo Braves. Despite Magic Johnson's stunning retirement due to testing HIV positive prior to the start of the season, the Los Angeles Lakers still managed to make their 16th straight NBA playoff appearance. It was their first appearance since 1979 without Johnson, Michael Cooper, or Kareem Abdul-Jabbar. Two games were postponed due to the Los Angeles riots following the Rodney King verdict, one being the Trail Blazers at the Lakers and the other was the Jazz at the Clippers. For safety purposes, both the Lakers and Clippers decided to move their home games to a nearby alternate venue; the Lakers played at the Thomas & Mack Center in Las Vegas, Nevada (later host to the 2007 NBA All-Star Game) for Game 4, the Clippers at Anaheim Convention Center in Anaheim, California for Game 4 (the Clippers returned to Anaheim at Arrowhead Pond in 1994 as an alternate venue and played there until 1999 whenever the Los Angeles Memorial Sports Arena was unavailable). Game 4 of the Blazers-Suns series was the last game ever played at the Arizona Veterans Memorial Coliseum. It was a long game which lasted two overtimes and broke the NBA's playoff game record for points scored in one game, the Trail Blazers outlasting the Suns by a score of 153-151.The Celtics' first round sweep of the Pacers would be their last playoff series win until 2002. After losing in the second round to Cleveland, Larry Bird retired after 13 seasons. As for the Cavs, it was their first Conference Finals appearance since 1976, but fell to the Bulls in 6 games. They would not return again until 2007. The 1992 Stanley Cup Finals was the championship series of the National Hockey League's (NHL) 1991–92 season, and the culmination of the 1992 Stanley Cup playoffs. It was contested by the Prince of Wales Conference and defending Stanley Cup champion Pittsburgh Penguins and the Clarence Campbell Conference champion Chicago Blackhawks. The Blackhawks were appearing in their first Finals since 1973. After the Blackhawks jumped to an early 4–1 lead in the first game of the series, Mario Lemieux and the Penguins came back to win the game, sweep the series in four games, and win their second consecutive and second overall Stanley Cup. It was the 99th year of the Stanley Cup, and the first to extend into the month of June. It was the last final for Chicago Stadium as it closed in 1994. The 1992–93 NBA season was the Bulls' 27th season in the National Basketball Association. The Bulls entered the season as the back-to-back defending NBA champions, having defeated the Portland Trail Blazers in the 1992 NBA Finals in six games, winning their second NBA championship. After two straight championships, the Bulls would yet again have another successful season finishing in first place in the Central Division, and second overall in the Eastern Conference with a 57–25 record. They also advanced to the Eastern Conference Finals for the fifth consecutive season, becoming the first team since the 1987–88 Boston Celtics to do so. Michael Jordan once again led the league in scoring with 32.6 points per game, and was selected for the 1993 NBA All-Star Game along with Scottie Pippen. In the first round of the playoffs, the Bulls swept the Atlanta Hawks in three straight games. In the semifinals, they swept the Cleveland Cavaliers in four straight games. Then after losing the first two games of the Eastern Conference Finals to the top-seeded New York Knicks, the Bulls would win the next four games of the series. Then they would then go on to win their third consecutive NBA championship, defeating regular season MVP Charles Barkley and the Phoenix Suns in six games in the 1993 NBA Finals. This was the last title the Bulls won while playing at Chicago Stadium. Chicago's offseason was also marked by Jordan's sudden retirement. The 1994 NBA playoffs was the postseason tournament of the National Basketball Association's 1993-94 season. The tournament concluded with the Western Conference champion Houston Rockets defeating the Eastern Conference champion New York Knicks 4 games to 3 in the NBA Finals. Hakeem Olajuwon was named NBA Finals MVP. This was also the first time that the Boston Celtics since 1979, and Los Angeles Lakers since 1976, missed the playoffs and their first-ever absence since the playoff field expanded to 16 teams in 1984. This was the first time that both missed the playoffs in the same year. This would not occur again until 2014. The biggest upset came in the first round, when the Denver Nuggets came back from a 2–0 deficit to beat the Seattle SuperSonics in five games, marking the first time in NBA history that an eighth seed had defeated a #1 seed. Denver stretched their improbable playoff run with the Utah Jazz to seven games after being down 0–3, but Utah defeated them in Game 7 91–81. The playoffs also featured the very first playoff series victory for the Indiana Pacers in their 18-year NBA existence, as they swept the Orlando Magic (who were making their first playoff appearance in franchise history) in the first round, then eliminated the top-seeded Atlanta Hawks 4–2 in the second round. The Pacers advanced within one game of the NBA Finals, but lost Games 6 and 7 of the Eastern Conference Finals to the Knicks. This was the first time since the ABA–NBA merger prior to the 1976–77 season that all former ABA teams (Pacers, Nuggets, Spurs, and Nets) made the playoffs in the same year. The Chicago Bulls, who made the playoffs despite the retirement of Michael Jordan, swept the Cleveland Cavaliers in the first round, but then lost in seven games to the Knicks in the Eastern Conference Semifinals. The Knicks made history by playing a record 25 playoff games (one short of the maximum), the most postseason games that an NBA team had ever played. The 2005 Detroit Pistons tied this record. However, it was broken by the 2008 Celtics. Their easiest series was the first-round 3–1 win over the Nets. New York then forced three consecutive Game 7s, eliminating the Bulls 4–3 in the Conference Semifinals, knocking off the Pacers 4–3 in the Conference Finals, both times at Madison Square Garden, before losing in Game 7 to the Rockets at The Summit in the NBA Finals, which meant New York was denied NBA and NHL titles. Game 4 of the Finals took place at the Garden a day after the New York Rangers won their first Stanley Cup in 54 years in Game 7 of the 1994 Stanley Cup Finals. Knicks coach Pat Riley made history by becoming the first (and to this date, the only) person in NBA history to have coached a Game 7 in the NBA Finals for two teams, having been with the Lakers in 1984 and 1988. However, he had the distinction to have become the first (and as of 2018, only) coach to lose a Game 7 in the NBA Finals on two teams, as his Lakers lost to the Celtics in 1984. It also denied him the distinction of becoming the first coach to win a Game 7 in the NBA Finals with two teams, as his Lakers defeated the Detroit Pistons in 1988. In the Western Conference, the Golden State Warriors made their last playoff appearance until 2007. Game 3 of the Bulls-Cavaliers series was the last game ever played at the Richfield Coliseum. Game 6 of the Bulls-Knicks series was the last game ever played at Chicago Stadium. Game 5 of the Nuggets-Sonics series was the last to be played at Seattle Center Coliseum before the renovations and renaming into KeyArena two years later. The Sonics played the intervening 1994–95 NBA season at Tacoma Dome in nearby Tacoma, Washington. The 42nd National Hockey League All-Star Game took place in Chicago Stadium, home of the Chicago Blackhawks, on January 19, 1991. Wayne P. Messmer (born Aug/Sep 1945 in Chicago, IL) is a professional speaker, singer, broadcaster, author and actor. He is a professional member of SAG/AFTRA and the National Speakers Association. He was the long-time public address announcer for the Chicago Cubs. He sings "The Star-Spangled Banner" before many Cubs games, as well as prior to all Chicago Wolves American Hockey League games. Messmer is part owner of the Chicago Wolves. He is a member of Phi Mu Alpha Sinfonia, the national fraternity for men in music. In the mid-1980s, Messmer was the newscaster/sidekick on WYTZ (Z-95) Radio's "Barsky Morning Show. He also was heard as the mid-day news anchor on WLS 890 AM. Since November 2011, he has hosted a jazz radio program Sunday evenings on 90.9fm WDCB Public Radio, the Wayne Messmer Radio Show. For many years, he also sang for the Chicago Blackhawks, Chicago White Sox, Chicago Bears and Chicago Sting. In January, 1991, when Messmer sang at the NHL All-Star Game at Chicago Stadium, he was nearly drowned out by cheers from the sellout crowd, mainly in support of the U.S. troops that had entered the Gulf War just days prior. He was fired by the Blackhawks in 1994 when he began working for another hockey team, the Chicago Wolves. They allowed him to sing the anthem one last time at the Hawks first home game at United Center on January 25, 1995. On October 14, 1994 he sang the national anthem at the Rosemont Horizon (now Allstate Arena) introducing the Chicago Wolves and the IHL to Chicago. It was his first public performance since being shot (see below). The St. Louis Blues invited Messmer to sing the anthem at their home game when they opened the Kiel Center. Messmer also frequently performs the Anthem with his wife Kathleen. Messmer's performance of the Anthem has always concluded with his trademark flourish on the final word "Brave" in which he concludes on the dominant note (5th). This trademark ending has frequently been copied by other singers. In April 1994, Messmer was shot in the throat outside a West Side, Chicago restaurant. He survived the incident and after months of therapy continued his career as a singer and announcer. However, this incident prevented him from being able to sing the anthem for the final six Blackhawks home games at Chicago Stadium before its closing. A recording of Messmer singing was used instead for these games. Messmer is also a Certified Speaking Professional, as recognized by the National Speakers Association, delivering a powerful keynote message of courage and conviction entitled "The Spirit of a Champion," drawn from his own personal life story.